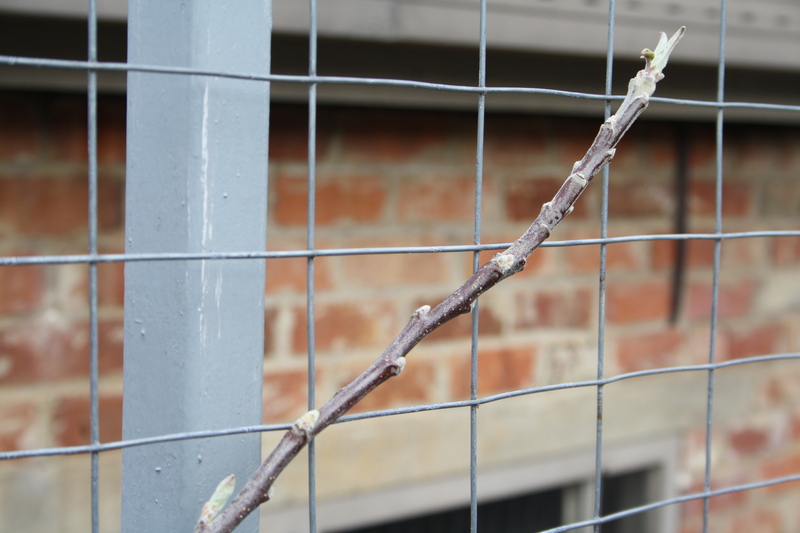 Stepover apples are grafted onto super dwarfing rootstock (usually M27) which if grown free-standing would only grow to approximately only 1.5 metres in height. They are usually trained as a horizontal T/espalier or as a cordon bent over at a 90 degree angle at knee height, hence the name. They are planted as maiden whips (a one year-old single stemmed tree, which is very flexible). They require fertile, free-draining soil, and a good water supply. Woodbridge Fruit Trees, a Tasmanian supplier with a large range of heritage apples for sale, has an article on stepovers here. The UK Royal Horticultural Society has an article here. And here’s an article by Alys Fowler, who I quite like to read and watch. Most sources advise that stepover apples a good, productive border plant for the vegetable patch, benefitting from the the nutrition and water provided to the patch. 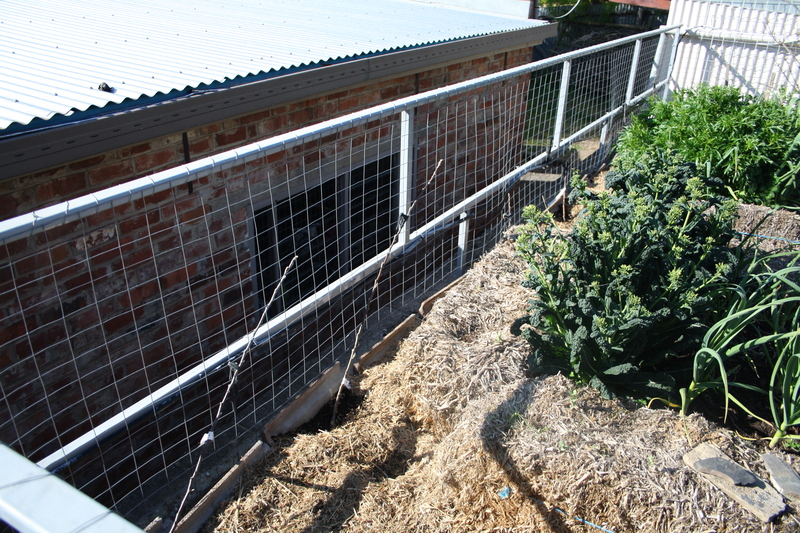 And because you can step over them into the vegie patch – they won’t shade out the vegies. Their roots are not vigorous and so won’t compete with the vegetables. Other benefits include the ability to grow apples in a very small space. And they bear heavily and precociously after only two years (as opposed to three or four years for other dwarf apples). As with all things in gardening, opinions differ. I have read different opinions as to how heavily they bear (some claiming they are of ornamental value only), some claiming they do compete with vegetables in the patch, and others claiming they are too susceptible to pests and disease. As mentioned above, most sources advise that being on a low vigour rootstock, they do require a lot of care – water, fertile soil, and no competition from weeds. I haven’t been able to get much advice from Australian growers other than from online fruit tree suppliers, because I can’t find any local gardener who grows them. Bek at Bek’s Backyard is growing some which you can read about here. There is also a good video about the dwarf apples, including stepovers growing at Woodbridge Fruit Trees in Tasmania from Gardening Australia here. I think they are much more common in the kitchen gardens of Europe than in Australia so I think I’ll do some research in books about European potagers. 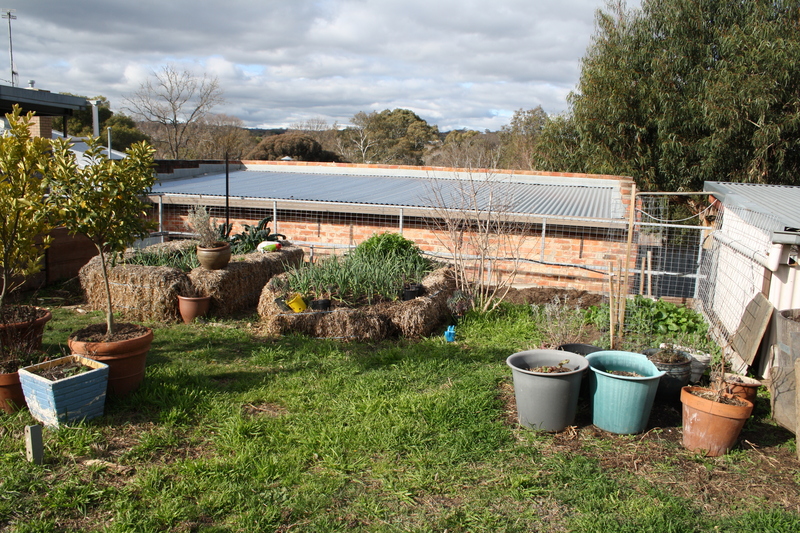 Hopefully I am part of a larger trend of home gardeners giving them a try now and there will be more information about growing them in Australian conditions. I decided to use stepovers largely because of their position above a tall retaining wall Initially I had planned on using M26 dwarfing rootstock (on which a free-standing tree would grow to about 2m-2.5m high) and keeping them pruned to about a metre, but after talking it over we decided that (aside from it being difficult to keep them that small by pruning) the roots might create a problem for the retaining wall, hence we went with M27/stepovers. But they will also be part of a larger bed of edibles and so will hopefully benefit from that too. 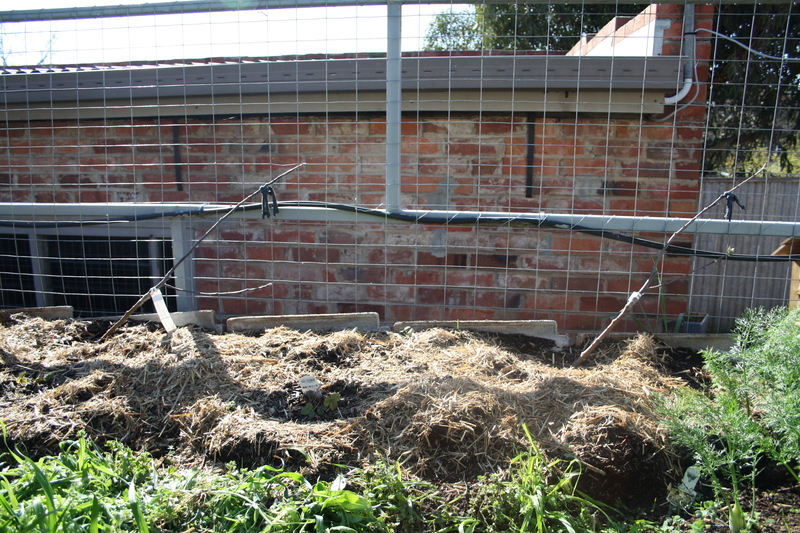 Location for stepovers – fence behind raised beds and in front of brick wall of garage. I bought mine at the end of winter, when online growers have sold out of a lot of stock, and have leftover stock on sale. So I really took what I could get, although I stuck to varieties I can’t buy in the shops. You can for example, get a stepover fuji, which apparently bears very heavily. I bought four stepovers from Woodbridge Fruit Trees in Tasmania, and the other three from Heritage Fruit Trees in Beaufort, Victoria. Yalca Fruit Trees in Northern Victoria also stocks stepovers. Stewart’s Seedling (aside from Cox’s Orange Pippin, this is the only other variety of the 17 I’ve planted that I’ve tasted. A grower in a nearby town had these for sale at the end of Winter. They were spicy and tart and delicious). Most sources advise growing stepovers as a single horizontal T at knee height. I’ve decided to grow mine as oblique cordons and to see if they’ll fruit at up to 90cm high. This is purely to try and fill up the fence I’m growing them against and to get them above the height of the raised beds to their west. 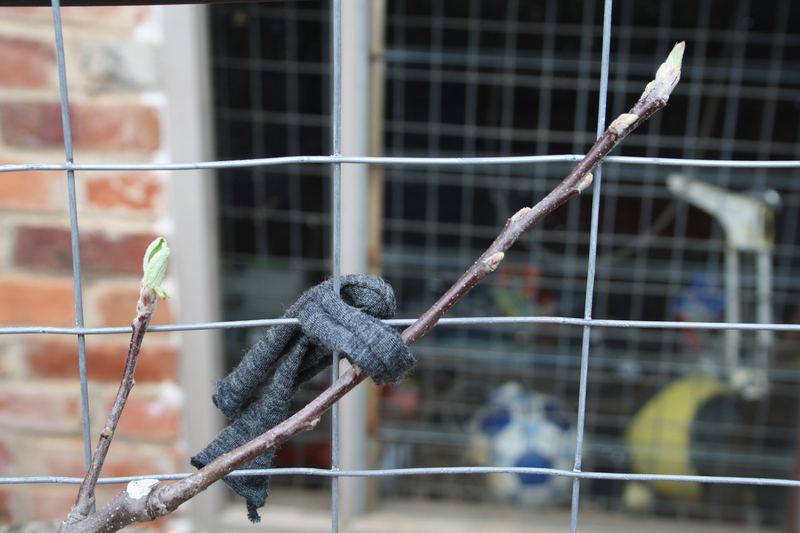 I might also try and either grow them as double cordons or an informal cordon with some horizontal arms. I don’t know anyone who has grown stepovers, so I don’t know how they will fare. 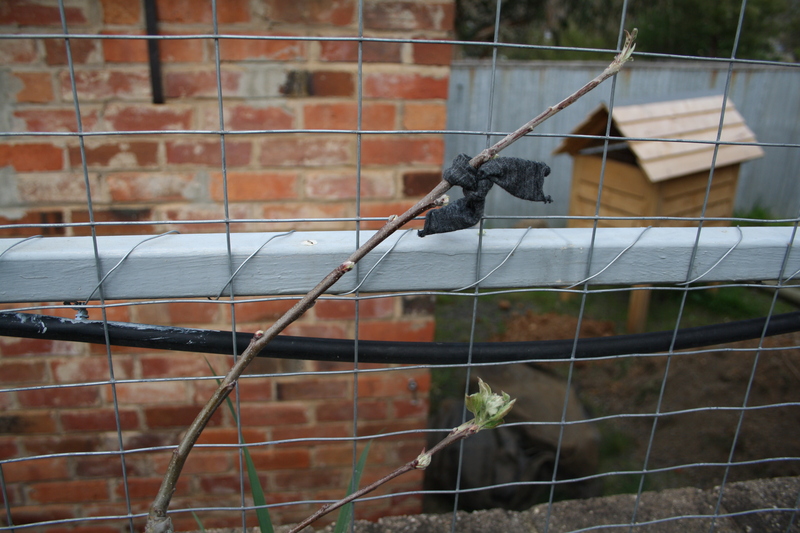 As they are mostly maiden whips, I didn’t need to prune. One or two had one lateral, which I’ve kept in the hope that I can form a double cordon and get fruiting spurs on the two branches. I don’t know if it’s possible to do that with stepovers, but what’s the worse that could happen if I try….. I spaced mine about one metre apart, as Woodbridge advised spacing of 1m – 1.5m. I was greedy and wanted as many varieties as I could fit in. 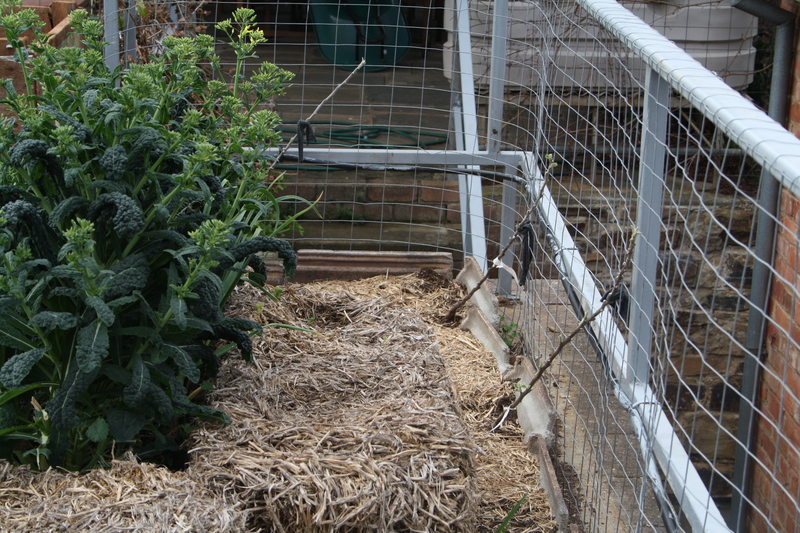 Also because I am planting them on a 45 degree angle to be trained as cordons, they will have more space to grow than if they were spaced at 1metre but trained horizontally. As of the last week in the Spring after they were planted, they are all sending out shoots, more vigorously than my M26 apples on the other side of the garden (although those do get less sun). I’ve underplanted them with two varieties of alpine strawberries which I bought from The Diggers Club, and I’ve thrown in some calendula seed from the Lost Seed as well.